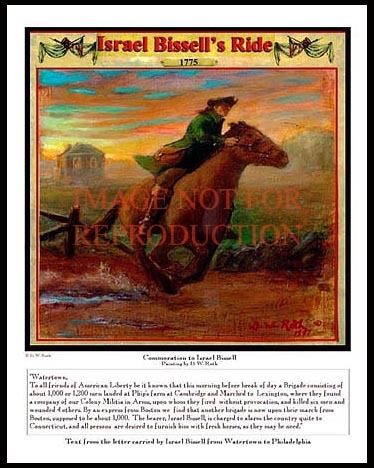 This print of the painting "Israel Bissell's Ride" is only for sale here. The painting was featured in the HBO special ASSUME THE POSITION WITH MR. WUHL also in the TimeLab 2000 Series on the History Channel. To order by check: Click here Please allow up to three weeks for delivery. Who was Israel Bissell? Heard of Paul Revere's ride? Same thing, but much, much more... It's the difference between 20 miles and 345 miles. 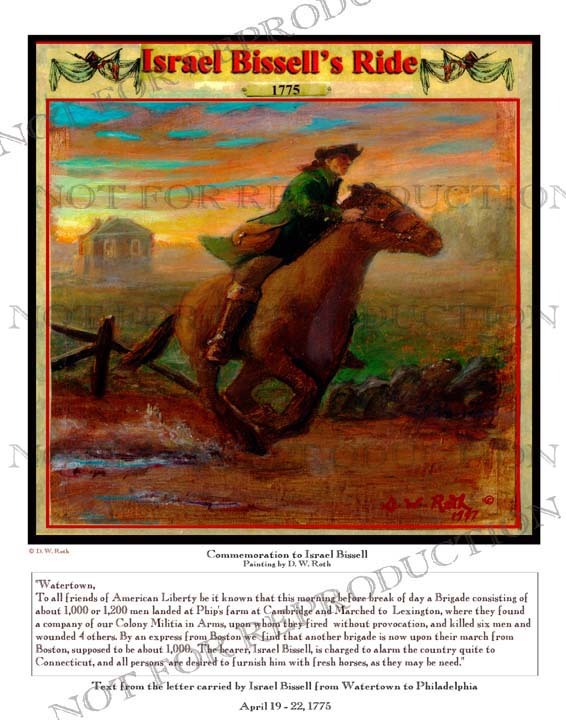 Israel Bissell was a 23-year old, little known post rider who carried the "call to arms" from Watertown, Massachusetts to the City Hall in Philadelphia. 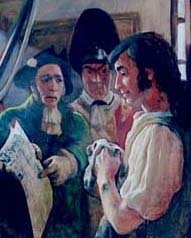 He alerted the colonists along the way ofthe British attack on April 19, 1775 in Lexington. He rode day and night for four days, six hours and some minutes covering 345 miles and roused citizens in tiny hamlets, towns and cities shouting of the impending danger that started with the "shot heard round the world" for American independence. "To arms to arms, the war has begun" he warned. Sleeping little, eating sparingly, changing horses, he persevered and sounded the alarm. The exhausted and disheveled Bissell delivered the message which was to change the course of this country. The rest is history. His body lies in a tiny cemetery in Hinsdale, Ma., a few miles from his home site that is marked by a simple boulder where the memory of his heroic ride is carefully preserved.